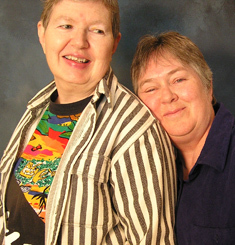 Poore ( left ) and Johnson were active in Chicago lesbian and print movements from the 1970s-1990s. Nancy Poore, a native Chicagoan, has lived and been a community activist in California and various parts of the Midwest. She is a retired editor, writer, publisher and printer. A co-founder of Helaine Victoria Press, she was also a longtime member of the Metis Press Collective in Chicago, the Feminist Writers Guild, and a founding member of the U.S. Alliance of Lesbian & Feminist Printers. Other affiliations include Black Maria, a Journal of Feminist Literature, and Feminists in Alternative Business. The couple now live in Michigan.